I know it's quite an irritating problem to pianists, but how many times do you feel your hands are so numb and your fingers freezing so that you struggle to play anything ! I live in Egypt, where the weather is not that chilly, but when it is cold I have a so hard time to try and get my fingers to work. I absolutely have no idea how do pianists living in freezing countries, maybe in Russia, deal with this. Even worse, I don't think there was any electric heating mechanism back in the early 20th century. I can't imagine how Rachmaninov, while he was in a below zero degree, managed to get his hands working and compose Rach 3 ! Sometimes before I play, I put my hands under hot water from the tub, or i put them in my pocket (but that doesn't' work most of the time ). I just play some scales and slow pieces to get my fingers warming up. I found out that Bach is always the best for those purposes, but not under extreme cold conditions ! So what do you guys do to turn on your piano playing mechanism when the weather is freezing?? Haha I didn't know it got cold in Egypt! I live in Michigan where winter starts in October and ends in April, lol. When I cant get my fingers to warm up, I bundle up in a lot of clothes (loose of course) or put a heater next to me when I'm playing. Then start with scales, slowly and bring them up to m120, and if its still cold then do some Bach, lol. I just keep putting on more clothes until my hands warm up. It doesn't matter how cold it is if you keep putting on more shirts and sweaters your hands will warm up. Sometimes I end up with 4 sweaters and long underwear. Once your body and hands warm up you can take some of the layers off and be ok. I live in Minnesota by the way which is just like Russia except without the oppression. When it got cold here, I used to put gloves on to play, I found out as soon as I started trying to play moderately fast stuff, that it just didn't work. Luckily for us, we have an upstairs room that just gets freaking hot, for no apparent reason. It was the middle of december, and I could just go up there and start breaking a sweat.. so I used to just go up there until I warmed up, then run down stairs and start playing.. I practice really fast stuff so my hands tend to warm up as i play also. I used to start out cold and find that 30 minutes of just fast playing, even if it's the wrong notes, warms your hands up. anything you move your fingers without stressing your forearms or hands is probably fine. worked for me, anyways. try some cluster improvisation...perhaps it will not sound great, but your hands will be very comfy. Even worse, I don't think there was any electric heating mechanism back in the early 20th century. I can't imagine how Rachmaninov, while he was in a below zero degree, managed to get his hands working and compose Rach 3 ! Er, burning wood on a fire? When my hands are cold I use gloves without fingers and they work great and I can play everything without restrictions. Soaking them in hot water doesn't work, they will become colder in a minute. In fact the opposite works! Soaking them in cold water! That attract all the blood flow to the cold area. Ever felt that burning sensation of warmth when you put your feet in the snow and then retract them? Warming up works too. So don't start with full pieces but warm up with scales or simply review of all 660 common chords. Let me point out that cold hands often don't depend on a cold environment. Your hands could be cold in summer or very warm in the harshest winter. It is often a matter of blood flow. So you hands are going to be colder after eating, if you're scared or worried, if you're tired and have not slept enough, if you haven't digested well. Eating more proteins and less sugars helps as they have a thermic effect. 2. Do rinse under hot water if you've been outside. 3. Start with something motoric and work through it slowly. 4. Don't use gloves of any kind. They impair your movement. well, sometimes you just have to learn how to deal with it as my teacher says. The room that I played in for my 1st competition was freezing cold and I still had to play fast runs etc. Now i'm training myself to do that. Almost every single day before I start practise, I play through Chopin's Etude in c sharp minor op.10 no.4 at full-speed. Some days it can be quite a struggle but I still force myself through it. My teacher also asked me to do that yesterday, but she decided to let me do it once slowly 1st. She said that imagine if you play upstage and have to start with a piece like that, without warming up, if you have no choice, you just have to do it, what are you going to do if you fail, failure is not an option than. Glenn Gould might tell you to soak your arms up to your elbows in hot water for 15 minutes. I drink hot tea before playing. It warms my hand (and whole body) under 3 mins. The key is to play shortly after drinking sth hot, because the warming effect doesn't last long unless you play. It's cool! Did you make it or buy it in stores? You hands become colder because water evaporates and carries the heat with it. Cold water, um... don't think it works as the blood vessels constrict and it makes your fingers even colder and more stiff. love that pic, it´s very similar to mine, but maybe it is not still enough when you want to articulate your finger e.g. playing some mozart... the fingers are still coldd! Take gingko biloba. It really helped for me. Do you smoke? Just curious cause I use loads of nicotine and my blood circulation in hands and feet are killing me during winter. It doesnt even have to be particulary cold. I bought them at the store but you can make them yourself by cutting out the extra parts. True, as long as you're in the cold water but as soon as you remove the hand from the cold water a circulatory compensation occurs that warm them, in fact that make them extremely hot. I'm no needlework expert (in fact I know nothing at all!) but I would think that after you cut the fingers off, wouldn't you have to stitch the ends to make sure that the wool doesn't unravel? Oui, oui! I think it's a difficult task to stitch the broken ends. This reminds me of a child's story about a kitty and his new wool sweater, which the wool end is not properly treated and it is stuck to something, so his sweater gets shorter and shorter as he move around. At the end of the day, he is wearing nothing. I want to ask mom to make me a pair of this. I notice the cold most just when the weather changes. When it makes a jump and becomes colder. I think it's because my body hasn't adjusted to the cold, so it's tense, or maybe that's part of the process of adjusting. Tense muscles are warmer muscles. I read a website about bike riding that stressed keeping your core body warm instead of worrying so much about the extremeties. Maybe that would work -- Put on warmer sweaters and coats and things. I keep finding easing off things but continuing play helps. I think the body just has to adjust, but you don't have to beat it up a lot in the process. What it does take is time though. Well it would be a problem with wool. If you want to cut the fingers off of gloves you must use cotton or pile gloves. What about having too much material between your fingers then? That happened to me with gloves. That pic has one big hole for the four fingers and a side hole for the thumb? i promise i'll try in winterr! I used to live in Holland most of my life, it can be freezing cold there, and even worse: watery cold (the ones who live in a similar climate know exactly what I mean). In a cold environment, warming up the hands by proper clothing and covering on the hands, may help. My experience is that hands warm up better in mittens, with all fingers together in one compartment so they are able to move around and warm each other. Sorry for the thumb, this one is on it's own, although when not cycling or driving an old, cold car, putting the thump in the finger compartment will work. take socks and put them over your hand. If you would like to play, simply cut off the toe part, plus make a hole on the side for your thump. Voila, no knitting needed. When the environment is not so cold, stimulating the blood supply to your hands may work better. Moving around (whole body), diet, not taking to much alcohol, caffeine an nicotine and some medications, may help. If you have Raynauds phenomenon in your fingers (cold, dead fingers due to vasoconstriction) that have no relation to any drugs or other medical restrictions, trying submerging your hands a few times per day in hot and cold water can help. Also certain medications normally taken to treat high blood pressure may relief symptoms and in that case a trip to the doctor's office is needed. I'm in a similar situation to timland's above. He lives in Minnesota and I live in eastern central Maine. The two states compete every day during the winters to see which is colder, International Falls or Caribou. In Maine we get a lot of snow during the winter (about 70" so far in my city), and I have to be out in it often "roof raking" snow from the roof, shoveling out the front and back stoops as well as a path for the oil man doing deliveries, and putting down calcium chloride to melt ice, most often with gloves off, as the substance will shrink leather such that you can't wear the gloves thereafter. If I'm out in temperatures of say zero to 15 F with a wind blowing, my hands are painfully cold, so I watch for frostbite. When I get back indoors, I wave my hands around in the warm air and rinse them in cold water. (If you've been in out in severe weather, hot water is not recommended.) My kids are grown, educated, and have jobs 120 miles away or so. Thus, I alone have to do these winter labors. None of this is helpful to a serious pianist, of course. When I approach the piano, I find it most helpful if I start by playing all major and harmonic minor scales through the Circle of 5ths. That gets the blood flowing, and by the time I turn to practicing repertoire, my hands are ready from that warm-up drill. Another thing that helps is that we have hot water (hydronic) heat, which in this climate is much more consistent than forced hot air or electric heat. So the house is always comfortable at about 72, and I never have cold hands while I'm indoors. You shouldn't argue about these fingerless woolen gloves but try them instead. They are great, keeping wrists and hands warm and the movement isn't restricted at all since there is a single opening for all four fingers. Keeping the fingers warm is sort of automatic because the blood has to flow through the warm hands first (doesn't work outside during cold winter of course). I have similar gloves and they help a lot when I have to play organ in badly heated churches. 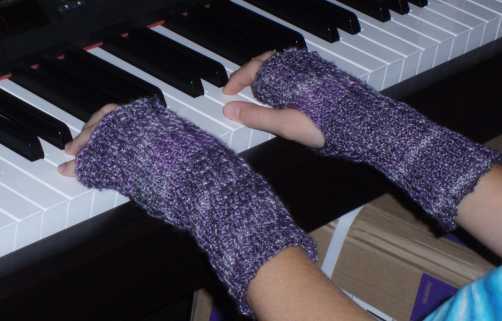 Of course, if your fingers are numb from cold, you need to warm up before playing, with or without gloves. And as already said, cold water works best to unfreeze the hands. I live in Vermont, USA, and it is cold! I have always had cold hands and feet-- I think my blood circulation is poor. I have to warm up slowly when I play in the cold. Eating spicy food seems to help (they say it stimulates blood flow). Ginger is said to improve the circulation, as well. "You can always put your hand between the buttocks. That's nature's 'pocket.' "
How do you play then? well, you can always use hand warmers! As far as warming outside of piano exercises, I often will soak a towel in water and put it in the microwave for a minute or so. The warm towel produces a result similar to taking a warm bath, but without the hassle. Anyway, that's just a little trick that I use sometimes. Of course, it is still best to warm up with Hanon exercises/ Czerny etudes afterwards! If I'm in a practice, I tend to warm up with slow scales/conjunct exercises. I gradually increase tempo, move to arpeggios, chords, etc. If I'm about to perform, I rub my hands together or play trills on my lap. Thank you for having the courage to ask. It is a universal problem, which should be addressed. 1) Anywhere you live or perform, there is a bathroom. Accordinlgy, the bathroom has hot and cold water. 2) You, prior to your performance, get two or three very big bowls, and then for a period of time (20 minutes prior to performance) you fill them up with very hot water. Then you soak very clean white towels in this water. Next, you soak the towels, wring them out, and the wrap them around your hands. 2) This technique has been used for decades. And, it works. 3) Have someone you trust semi-vigorously massage your lower forearms (not the upper) just right before you go on. Once again, all of this has been done forever, and it works! All very good suggestions -- to which I will add one more: hot wax bath. I have very poor circulation in two fingers, the result of a major injury, and I acquired a hot wax bath as part of the therapy. Works wonders. But the bowl of hot water techniques is a lot cheaper -- and is available almost anywhere! I don't have any trouble playing in cold ambient, unless I am actually shivering. Sunday School rooms in outbuildings were ofton poorly heated and drafty in my youth, and I played in the assembly there. I recenlly played organ in a church on a Wednesday in January when the heating repair men were replacing the boiler. No problem, other than the broken capture action we were waiting for a phone call back from Petersen service about. My hands are very cold, maybe 5 degrees colder than my oral temp. When my Mother had cancer they were treating her for Reynaud's phenomenon, but in fact I've always had cold hands and I'm quite healthy. Women always complain about my hand being cold when they shake it. So, I don't understand the problem. This is one of the very few advantages of being physically native American rather than European or African, I guess.